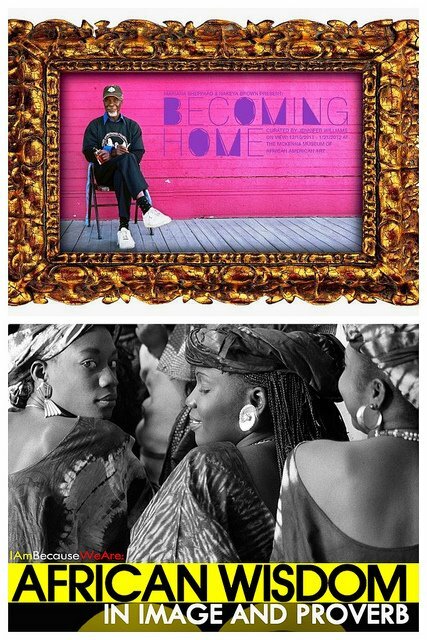 BECOMING HOME For members of the African Diaspora, home is constantly being redefined. Think the Trans-Atlantic Slave Trade. Think the Great Migration. Think Hurricane Katrina. Despite being uprooted a community still finds a way to grow. For the inhabitants along the west bank of the Mississippi River, the region most commonly referred to as the German Coast, the aesthetic of home is situated between two distant periods—antebellum and 21st century South. Vestiges of grandeur line the River Road: extravagant plantation homes, vast acreages of oak trees, and candy painted impalas. Becoming Home, the collaborative photographic series between Mariana Sheppard and Nakeya Brown, curated by Jennifer Williams, explores the modern social make-up of life in the River Region from a historical, cultural and sociological perspective. AFRICAN WISDOM IN IMAGE AND PROVERB I Am Because We Are: African Wisdom in Image and Proverb is a stunning collection of photographs taken by Betty Press while she lived and traveled in Africa. One hundred and twenty-five photographs have been paired with African proverbs compiled by Annetta Miller, an American born in Tanzania and living in East Africa most of her life. In this collection, the message is significant and life-affirming: I am because we are; we are because I am. The title of the book comes from a well known proverb attributed to South Africa. It speaks to the interconnectedness and responsibility that we have for each other. In embodies the concept of Ubuntu, an African philosophy of living harmoniously in community.